The Land Rover’s Discovery has been crowned Scottish Car of the Year 2017. 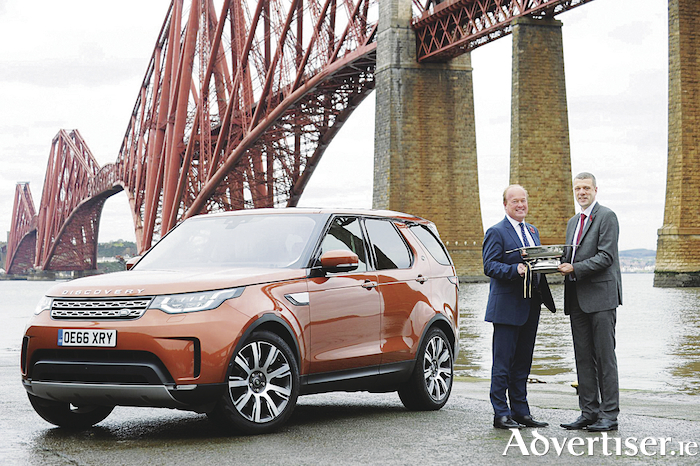 The award presentation with the award-winning Discovery at the iconic Forth Rail Bridge, South Queensferry, Scotland. The new Land Rover Discovery SUV triumphed in its segment to be named best-in-class by our Celtic cousins in the Association of Scottish Motoring Writers before fighting off tough competition from other category winners to take the top title. It is the third time a Land Rover has emerged victorious at the respected industry awards - the previous Discovery 4 model wowed judges following its debut in 2009 and the Range Rover Evoque enjoyed success in 2011. The judges' statement said that from when they first drove the fifth generation Discovery, they were in no doubt that it’s one exceptional vehicle. Adding: “Indeed, it’s the breadth of ability which makes the Discovery so special. This is a 4x4 which remains true to Land Rover’s traditional spirit of adventure – it really can climb mountains and ford streams – while also being brilliant around town, on country roads and motorways. The Scottish Car of the Year (SCOTY ) awards also delivered particularly impressive results for Ford, Mazda, Suzuki and Skoda. Not only did a new version of an old favourite, the Fiesta, take the best ‘Supermini’ title but an evolution of last year’s top ‘Hot Hatch’, the Focus RS Mountune, ensured sporting success for Ford again in 2017. Mazda also had cause for celebration, with the MX-5 RF and CX-5 named best ‘Drop Top’ and ‘Crossover’ respectively. Suzuki, meanwhile, received recognition for its two newest models. Retro charm and clever interior packaging put the Ignis at the top of the ‘Compact’ pedestal while the Boosterjet-powered Swift won the special ‘Eco’ prize. Skoda’s Kodiaq, a runner-up in the race for the overall SCOTY title, won the ‘Seven Seater’ category while the Yeti won the ‘Used Car’ section. Elsewhere, Vauxhall (Opel here ) displayed a return to form in the 'Family’ category with the Insignia Grand Sport winning by a comfortable margin. Following last year, when the V90 was named ‘Best Estate Car’ and overall winner, the addition of four-wheel-drive and extra ground clearance enabled Volvo to continue its winning form with the V90 Cross Country. In the ‘Executive’ arena, BMW’s outstanding new 5 Series proved unbeatable, while sister brand MINI scooped the new ‘Compact Crossover’ category with the new Countryman model. One of the most diverse categories is ‘Sports’, and British design and engineering know-how put the sensational McLaren 720S supercar on the podium. Finally, the ‘Special Design and Innovation’ gong went to DS Automobiles for launching the UK’s first contactless payment car key.